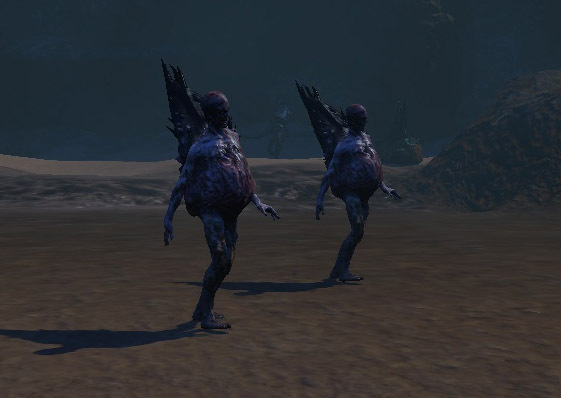 One of the things I’ll say for Funcom, they really know how to set up their mobs for immersiveness. More so than other MMOs, it seems to me, they don’t mind placing these things to make sense, rather than follow an “accessibility” or design rule that says, mobs or clumps of mobs must be spaced out at regular intervals, and all roads must be kept clear, yadda yadda. While it makes their zones potentially more treacherous, it comes across as very believable. The Secret World is no exception. Clumps of zombies feed on corpses. Corpses you think are corpses will get up and vicously raven all over you. Wendigos lay traps and ambushes for unwary travelers, yes, even along roads or paths. Everybody knows the Ak’ab shuffle dance (step to the left! turn around! step to the right! turn again!) and the layout of their burrows by now, no doubt. Broodmarks slow their prey along the outskirts, where hunters will come to check on them. Sentries surround their burrows, while groups of their young scurry about. And right smack in the center, their royal burrow and queen awaits. By showing, and not just outright telling, you easily understand that Ak’ab are bugs, of a very annoying kind. Incubators. They’re human-sized, with a brood pod-y growth lanced through their stomachs and out their backs. In other words, they were probably humans once. Hopefully taken from dead ones, but who knows, the horror of it could be that they were still alive when the Draug got hold of them. If you give them some unmolested time, they reach a stage of their development that makes them do this. They squat down and… metamorphose into this. OMG. 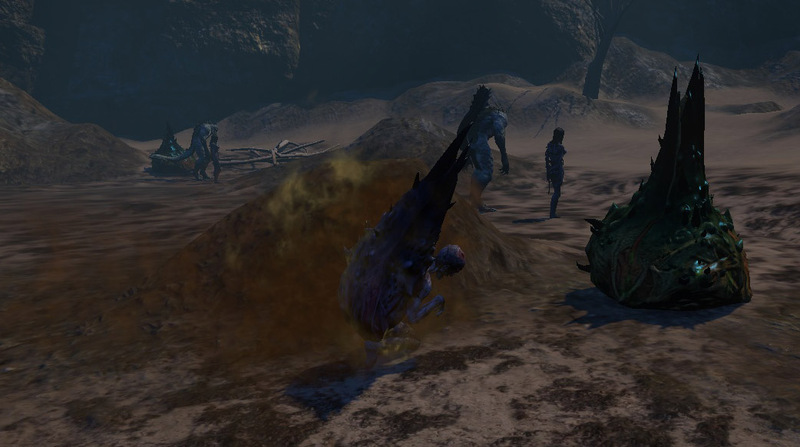 Through all of Solomon Island, I’ve been shooting dozens and dozens of these brood pods to stop Draug from hatching out of them, but it wasn’t until I watched the entire incubator cycle that it really hit me where the hell these brood pods COME FROM. 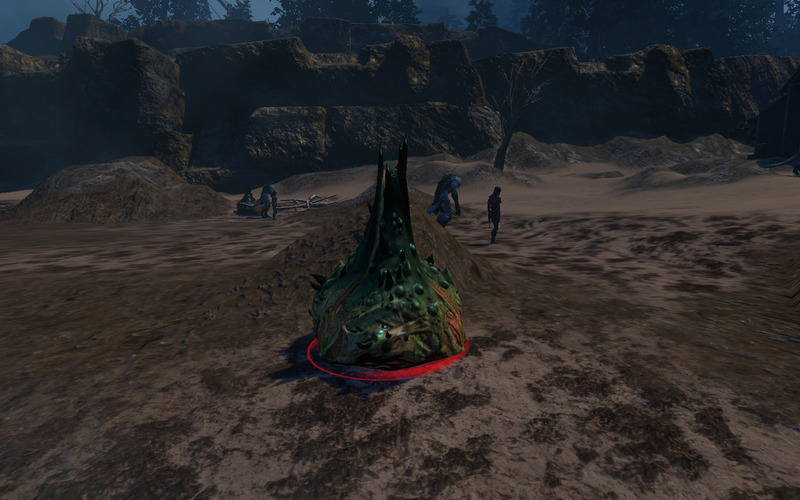 Again, if you leave the brood pods unmolested for a time, they will promptly hatch (or is the correct term ’emerge’ from their pupal stage) into full ‘adult’ Draug, indistinguishable from the maulers and broodwitches and so on that hang around the beach. If not, then a weaker in hp version, prefixed by the words Newly Formed, Draug will pop right out and start attacking you in self-defense. Now isn’t that a whole lot more interesting a cycle than a mob with a differently-colored skin just appearing out of nowhere and pacing all of six inches from where they spawned in?